Tea plant (Camellia sinensis (L.) O. Kuntze) is sensitive to low temperature and highly susceptible to damage in chilling stress. To examine the responses of tea leaves to chilling stress, changes in protein expression were analyzed using a proteomic approach. One-year-old tea seedings were treated at 4°C for 24 h and then recovered for 24 h. By fractionation, approximate 1000 protein spots were separated and visualized on CBB-stained 2-D gels. A total of 10 protein spots were increased, 9 were decreased and 4 proteins were induced. MALDITOF/ TOF mass spectrometry analysis allowed the identification of 18 differentially expressed proteins, including well known and novel coldresponsive proteins. Proteins showed enhanced degradation during chilling stress, especially the photosynthetic proteins. The identified proteins are involved in several processes, such as signal transduction, transport, disease/defense, photosynthesis, and carbohydrate, energy, pyrimidine and nitrogen metabolisms. This study provides new insights into the complex molecular networks within tea leaves involved in the adaptation to chilling stress and stress signals. Low temperature is one of the serious environmental stresses affecting plant growth and agricultural production. It not only inhibits metabolic reactions but also causes osmotic, oxidative, and other damages . Chilling temperatures that range from 0 to 12°C are common during the growing season and can substantially decrease plant productivity . Plants respond and acclimate to chilling stress through various biochemical and physiological processes, thereby acquiring stress tolerance. Not surprisingly, these mechanisms are complex, and include changes in physiological and biochemical reactions, gene expression and protein synthesis [3,4]. Comparative proteomic studies based on analyzing contrasting plant genotypes in the stressed and non-stressed conditions are very informative and give insights into the plant reactions to environmental stimuli. Proteomics tools based on two-dimensional electrophoresis (2-DE) and mass spectrometry (MS) provide an effective approach to investigate the molecular response of plants to stress . Proteomic approaches were also applied to find general stress related proteins [6-8]. Differential analysis of proteome applying 2-DE method to seek for specific proteins of differential expression and then identification by peptide mass fingerprinting (PMF) has been widely used in many fields of research, with a good deal of important achievements [9-11]. Those identified stress proteins were in general attributed to a wide metabolic pathway affected by stresses in many plants. Much attention has been paid to proteomic studies on crop plants in recent years. Protein expression changes in response to abiotic stresses have been studied in maize , rice  and soybean . Tea plant (Camellia sinensis (L.) O. Kuntze), belonging to the family Theaceae, is one of the most important economic crops in China, India, Sri Lanka, Kenya, among others . As an economic crop that is highly subjective to cold stress, its molecular mechanism of cold adaptation/resistance acquiring has been of great concern [8,16]. To date, little work has been conducted to uncover proteomic changes under chilling stress. Recently, proteomic analyses have begun to address the biochemical and molecular mechanisms behind the plant response to chilling stress. In this study, we analyzed the differential protein expression profiles of tea leaves using the ‘Yingshuang’, a cold-tolerant variety, to identify proteins that are differentially expressed under chilling stress. The data of this study will provide new insights into the molecular mechanisms underlying the responses of tea plants to chilling stress. The study also provides valuable information that will lay the foundation for further studies of the functions of genes that respond to chilling stress. Healthy and uniform one-year-old clonal seedlings of tea (C. sinensis cv. Yingshuang) were used in this study. ‘Yingshuang’ has strong stress resistance and high yield. The plants were grown in a growth chamber with 25/23°C (day/night), photonflux density of 350-400 μmol m-2s-1, 16-h photoperiod, and relative humidity of 60-80 %. These plants were treated at 4°C for 24 h and then recovered for 24 h. Low temperature treatment was started after 1 h of illumination by setting the temperature to 4°C, which was reached about 30 min later. The temperature was returned to 25°C after 24 h of treatment. The third leaves of the plants were fixed in liquid nitrogen, stored in -80°C refrigerator and reserved for experiment. The leaves were cut into 1 cm segments and washed three times with ultrapure water. The segments were placed in tubes containing 20 ml of ultrapure water and incubated at 25°C. Two hours later, the electrical conductivity of the bathing solution (Lt) was measured. Then the tubes were incubated at 100°C for 20 min and the electrical conductivity (L0) was measured again. The relative electrolyte leakage was calculated by the formula Lt/L0 x 100%. Five replicates were performed for each sample. The leaf proteins were extracted using a modified trichloroacetic acid/acetone procedure . Protein pellets were dissolved in a rehydration solution (8 M urea, 2 % CHAPS, 0.5 % IPG buffer, 2.8 mM DTT) at room temperature. After centrifugation at 13,000 rpm for 60 min at 4°C, the protein supernatant was collected and stored at -80°C until use. The protein content was determined using the Bradford method . For 2-DE, A liquid rehydration buffer (8 M urea, 4% CHAPS, 0.2% w/v carrier ampholyte, 65 mM DTT) containing 405 μg protein was used to hydrate the strips for 16 h. The Ettan IPGphor system and pH 4–7 IPG strips (17 cm, linear, Amersham Biosciences) were used for Isoelectric focusing (IEF). SDS-PAGE was performed with 12% gels using the PROTEAN II xi Cell system (Bio-Rad). The electrophoresis was carried out at 16 mA/gel for 30 min and then 24 mA/gel. Proteins were detected by CBB G-250. At least triplicate gels were performed for each sample. The 2-D gels were scanned using a UMAX PowerLook 2100XL scanner (Willich, Germany). Image analysis was accomplished using PDQuest 8.0 software (Bio-Rad). After automated detection and matching, manual editing was carried out. Three well separated gels of each sample were used to create “replicate groups”. Statistic, quantitative, and qualitative “analysis sets” were created between the control group and each treated group. In the statistic sets, the Student’s t test and significance level of 95% were chosen. In the quantitative sets, the upper limit and the lower limit were set to 1.5 and 0.5, respectively. Then the Boolean analysis sets were created between the statistic sets and the quantitative or qualitative sets. After image analysis, the corresponding spots of interest on the gels were selected for further analysis. The selected points were manually recovered from preparative CBB stained gels, destained for 1 h at room temperature using a freshly prepared washing solution consisting of 100% acetonitrile/50 mM ammonium bicarbonate (NH4 HCO3) (50:50 v/v). Trypsin digestion and MALDI-TOF/TOF analysis were performed as described before . The digested protein samples were mixed with the matrix solution (7 mg/mL α-cyano-4-hydroxycinnamic acid in 0.1% TFA and 50% ACN), and then l μL of this mixture was spotted onto the target plates. Mass spectra were acquired on a MALDI-TOF/TOF tandem mass spectrometer, ultrafleXtreme. The instrument was operated in reflectron mode. Database searching and both PMF and MS/MS were performed using the Mascot 2.3.02 software (Matrix Science, London, UK). The database was set to National Center for Biotechnology Information (NCBI) nonredundant which contained 2,464,940 sequences including 154,691 sequences of green plant. PDB (protein database) of vitis vinifera, Citrus sinensis, Salicaceae, Camellia sinensis, were used for performing sequence alignment. The plasma membrane acts as the primary site to sense and respond to environmental changes. However, more or less severe stress often damages the membrane, resulting in leakage. The leakage of electrolytes is widely used as an assay for membrane damage . To evaluate the adverse effects of chilling stress quantitatively, here we performed the relative electrolyte leakage assay. As shown in Figure 1, the relative electrolyte leakage increased from 14.9% to 18.5% after 24 h of chilling treatment. The leakage decreased and was close to the basal level after 24 h of recovery (13.9%). The relative electrolyte leakage from leaves was significantly different (p< 0.05) between the 0 h and 24 h treatments, indicating that tea leaves exposed to 4°C for 24 h had been suffered from adverse effects. Figure 1: The relative electrolyte leakage of tea leaves by chilling stress. One-year-old tea plants were treated at 4°C for 0 and 24 h and then were allowed to recover for 24 h (R24 h). Five replicates were performed for each sample. The relative electrolyte leakage is shown. Values are expressed as the mean ± SE and were compared using the Duncan’s multiple range test (P<0.05). To investigate the changes of protein profiles during chilling stress, we carried out 2-DE analysis of the total proteins in tea leaves from three biological replicates. At least triplicate gels were performed for each sample, and they showed a high level of reproducibility. The representative gels are shown in Figures 2A and 2B represents the position of differentially expressed protein spots for both accessions in 2-D gels. Most protein spots distributed between pI 4 and pI 7.0. More than 1,000 protein spots were reproducibly detected by PDQuest 8.0 software on CBB-stained gels. Of these, 23 spots had changed significantly compared to the same spots observed at the 0 h time point (P< 0.05). These differentially expressed proteins included 10 spots whose size increased, 9 spots whose size decreased (Figure 2C) and 4 newly appearing spots. Three typical spots are enlarged in Figure 2D. Note that, although some spots were also decreased or increased after 24 h of recovery (R2 4 h), the changes were less pronounced than that of 0 h time point. Figure 2: Representative 2-DE gels of tea leaf proteins. One-year-old tea plants were treated at 4°C for 0, 24 h and then were allowed to recover for 24 h (R24 h). A 2-DE gel of the control sample. B 2-DE gel of sample treated at 4°C for 24 h. C Quantitative image analysis revealed 19 protein spots that changed their intensities significantly ( p< 0.05) at 24 h time point D Temporal changes of three typical differentially expressed proteins spots after chilling treatment. a) One protein spot was increased. b and c Two protein spots were decreased. To identify the differentially displayed proteins, the protein spots were excised from the preparative gels, in-gel digested by trypsin, and then analyzed by a MALDI-TOF/TOF MS. In total, 18 differentially expressed spots were successfully identified and their values of alteration in comparison with control values. Functional annotations of the proteins were conducted using Blast2GO program against the non-redundant protein database (NR; NCBI). Some of the identified proteins were annotated either as unknown and hypothetical proteins or as proteins without specific function in the database. To gain the functional information about these proteins, we searched their homologues with BLASTP (www.ncbi.nlm.nih.gov/BLAST/) using their protein sequences. Four corresponding homologues with the highest homology. All the spots shared more than 79% positives with homologues at the amino acid level, indicating that they might have similar function. Besides the unknown proteins, the rest of the identified proteins were classified into several functional categories (Figure 3). 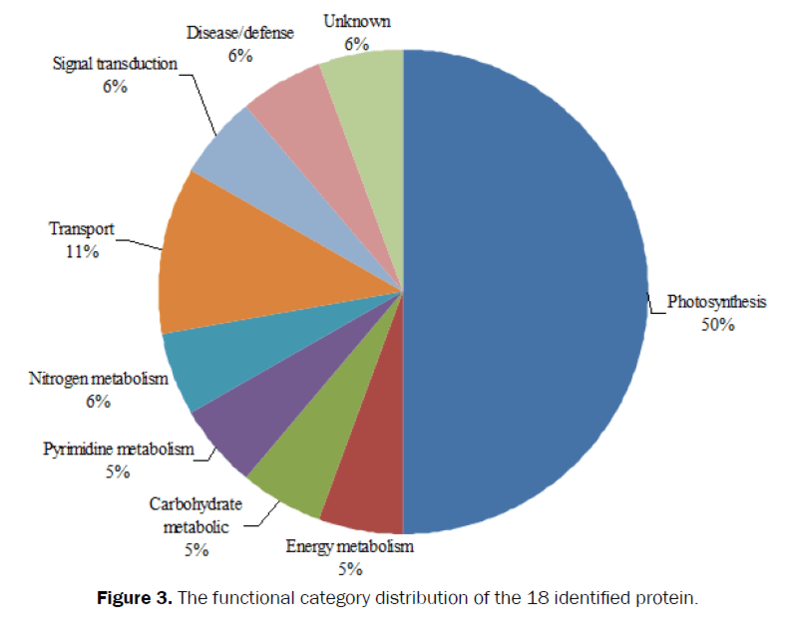 Figure 3: The functional category distribution of the 18 identified protein. Chilling stress regulates the accumulation of several proteins. This includes an increased abundance of proteins related to photosynthesis, such as ribulose-1,5-bisphosphate carboxylase/oxygenase large subunit (RcbL spots 305, 306 and 440), ribulose-1,5-bisphosphate carboxylase/oxygenase (Rubisco) small subunit (spots 422 and 424). It also includes an increased abundance of proteins related to energy and nitrogen metabolisms, such as chloroplastic ATP synthase beta subunit (spot 159) and theanine synthetase (spot 292). Chilling stress induced the accumulation of oxygen-evolving enhancer protein (OEE spot 146), malate dehydrogenase family protein (spot 187), PREDICTED: CEN-like protein 2-like (spot 182) and an unknown protein named hypothetical protein VITISV_033259 (spot 25). The results suggest that the reduction in photosynthesis following chilling stress treatment can be attributed to the reduced levels of (1) proteins in Calvin cycle enzymes, such as RcbL ( spots 365, 395 and 400), (2) one hypothetical protein (spot 87) involved in metabolic, (3) proteins involved in transport, such as PREDICTED: brefeldin A-inhibited guanine nucleotide-exchange protein 2-like (spot 301), hypothetical protein POPTR_0002s09680g (spot 390) and (4) one unnamed protein product (spot 166) involved in disease/defense. Several interesting differentially expressed proteins appeared to be the products of degradation because their observed Mr values were smaller than the theoretical ones. A particular case was the photosynthetic proteins, including Rubisco large subunit (RcbL), Rubisco small subunit and oxygen-evolving enhancer protein. Two proteins were identified in more than one spot excised from the same gel (Figure 2). The first protein is the RcbL (gi|388893215, gi|118917738 and gi|555945924). It was identified in six protein spots, indicating the occurrence of either posttranslational modification or degradation. The observed molecular masses of spots were smaller than the theoretical one. The second protein is Rubisco small subunit, which was identified in two spots as well (spots 422 and 424). In this work, we attempted to investigate the proteome changes involved in the chilling-induced tea leaves using proteomic approaches. A total of 18 proteins displayed differential expression levels were successfully identified during the chilling stress. The identified proteins are mainly involved in several processes, i.e. signal transduction, photosynthesis, transport, and disease/ defense and carbohydrate metabolism. Different proteins and their expression patterns related to chilling stress response are discussed below. Photosynthesis is a key plant process affected by stress [9,19,20]. The rate of photosynthesis usually decreases during exposure to various stresses in higher plants . In this study, the expression patterns for most photosynthesis-related proteins are complex. In chilling-stressed seedlings of tea, Rubisco small subunits were found to be up-regulated. Although the RcbL expressions (spots 305, 306 and 440) were increased at 24 h time point, the other RcbL expressions were decreased. Rubisco fragments displayed different expression patterns during growth . Furthermore, our results also showed that several photosynthetic proteins in tea leaves were partially degraded. Our results are similar to the previous reported that the analysis of the rice anther proteome under cold stress identified seven proteins as breakdown products . These results indicated that low temperature enhanced the protein degradation. A typical example is RcbL of which 6 fragments were identified in this study. The degradation of RcbL was also reported in other proteomic studies [22-24]. Under chilling stress, the OEE was induced and it was identified as protein associated with the oxygen-evolving complex (OEC).The increased expression of OEE seems to be associated with the dehydration induced by cold injury. Similar to our results, Abbasi and Komatsu  found that the expression of OEE2 was induced by NaCl and ABA in rice leaf sheath. Increased expression of OEE2 under salt stress has been reported in Mangrove and it is known that OEE2 and OEE3 can easily be removed from the PSII complex in the presence of NaCl . Alterations in the group of metabolism-related proteins were observed for ATP synthase beta subunit (spot 159), malate dehydrogenase family protein (spot 187), theanine synthetase (spot 292) and hypothetical protein POPTR_0012s04020g (spot 87). In our study, chilling stress enhanced expression of ATP synthase beta subunit and malate dehydrogenase family protein, two enzymes involved in generation of energy and carbohydrate metabolic, respectively. It implies that their enhancement might help to produce more energy needed in abiotic stress. Theanine synthetase (TS , spot 292), takes place both in root and shoot, was increased under chilling stress. The accumulation of the protein is positively affected by chilling stress. Meanwhile, recent studies have revealed that theanine biosynthesis, derived from nitrogen metabolism in tea plants, could be influenced by salt treatment . In contrast, a hypothetical protein POPTR_0012s04020g (spot 87) was decreased after chilling treatment. It showed a homology (79 %) with the predicted protein dihydropyrimidine dehydrogenase [NADP(+)]-like. Dihydropyrimidine dehydrogenase (DPD) is the initial and rate-limiting enzyme of the uracil catabolic pathway . The decrease of expression of the protein implies that chilling stress results in a metabolic alteration. One candidate component involved in signal transduction was predicted as CEN-like protein 2-like (spot 182). It was induced in tea leaves after 24 h of treatment. Mimida  isolated and compared the plant phosphatidyl ethanolamine-binding proteinlike genes TERMINAL FLOWER1 -like and CENTRORADIALIS -like, which are involved in the control of shoot meristem identity and flowering time. One unnamed protein product (spot 166) was found to be decreased in chilling stress. The unnamed protein product was homologous to predicted DEAD-box ATP-dependent RNA helicase 50-like, which has been shown to associate with cellular defense response [28,29]. CsdA, demonstrated as a member of this family, could be induced by cold shock . RNA helicases from the DEAD-box family are found in almost all organisms and have important roles in RNA metabolism . Two hypothetical proteins including POPTR_0002s09680g (spot 390) and BIG2-like (spot 301) were found to be decreased in chilling-stressed leaves. We found that the POPTR_0002s09680g showed a high homology with Ribosome-binding protein (RRBP) in Ricinus communis. RRBP1 (Q9P2 E9, EN SP0 000036704 4.1) is an endoplasmic reticulum membrane protein [32,33] that is essential for ribosome binding and for the translocation of nascent proteins across the membrane of the rough endoplasmic reticulum . Another candidate component involved in transport was predicted as BIG 2-like. ADP-ribosylation factors (ARFs) are critical in vesicular trafficking. Brefeldin A-inhibited guanine nucleotide-exchange protein (BIG) 1 and 2 activate ARFs by accelerating replacement of bound GDP with GTP [35-39]. In this paper, the molecular responses to chilling stress were investigated at the protein level in tea plant. Differentially expressed proteins identified by a comparative proteomic approach during chilling stress were identified in several processes, mainly included transport, disease/defense, photosynthesis, and carbohydrate, energy and nitrogen metabolisms. There were also several novel and unique proteins identified in tea plants. The findings will help drive further work to develop strategies for gaining a comprehensive knowledge of the mechanisms in tea plants. This theme is subsidized by the livelihood project of Qingdao city (No. 13-1-3-85-nsh) the breeding project of Shandong province (No. 2012LZ12-03, 2013LZ12-03, 2014LZ12-03) and the technology system of modern agricultural industry in Shandong Province (SDAIT-21). Chinnusamy V, et al. Cold stress regulation of gene expression in plants. Trends Plant Sci 2007; 12: 444-451. Allen D and Ort D. Impacts of chilling temperatures on photosynthesis in warm-climate plants. Trends Plant Sci 2001; 6: 36-42. Karimzadeh G, et al. Cold-induced accumulation of protein in the leaves of spring and winter barley cultivars. hungarica 2005; 56: 83-96. Wang X, et al. Proteomic analysis of the cold stress response in the moss, Physcomitrella patens. Proteomics 2009; 9: 4529-4538. Shu L, et al. Proteomic analysis of rice leaves shows the different regulations to osmotic stress and stress signals. J Integr Plant Biol 2010; 52: 981-995. Ali G and Komatsu S. Proteomic analysis of rice leaf sheath during drought stress.J Proteome Res.2006; 5: 396-403. Lee D, et al. A proteomic approach in analyzing heatÃ¢ÂÂresponsive proteins in rice leaves. Proteomics 2007; 7: 3369-3383. Yan S, et al. Comparative proteomic analysis provides new insights into chilling stress responses in rice. Molecular & Cellular Proteomics 2006; 5: 484-496. Ashoub A, et al. Comparative analysis of barley leaf proteome as affected by drought stress. Planta 2013; 237: 771-781. Gharechahi J, et al. A proteomic analysis to identify cold acclimation associated proteins in wild wheat (Triticum urartu L.). Mol Biol Rep 2014; 41: 3897-3905. Palsuledesai C, et al. A combination of metabolic labeling and 2D-DIGE analysis in response to a farnesyltransferase inhibitor facilitates the discovery of new prenylated proteins. Mol Biosyst 2014; 10: 1094-1103. Pechanova O, et al. Maize proteomics: an insight into the biology of an important cereal crop. Proteomics 2013; 13: 637-662. Lee D, et al. Chilling stress-induced proteomic changes in rice roots. J Plant Physiol 2009; 166: 1-11. Cheng L, et al. Comparative proteomic analysis of cold-induced sweetening in potato (Solanum tuberosum L.) tuber. Acta physiologiae plantarum 2014; 36: 1197-1210. Chen L, et al. Genetic improvement and breeding of tea plant (Camellia sinensis) in China: from individual selection to hybridization and molecular breeding. Euphytica 2007; 154: 239-248. Wang X, et al. Global transcriptome profiles of Camellia sinensis during cold acclimation. BMC genomics 2013; 14: 415. Ramagli LS and Rodriguez L. Quantitation of microgram amounts of protein in two-dimensional polyacrylamide gel electrophoresis sample buffer. Electrophoresis 1985; 6: 559–563. Gharechahi J, et al. An integrated proteomic approach to decipher the effect of methyl jasmonate elicitation on the proteome of Silybum marianum L. hairy roots. Plant Physiol Biochem 2013; 70: 115-122. Cheng L, et al. Proteomic analysis of soybean [Glycine max (L.) Meer.] seeds during imbibition at chilling temperature. Molecular breeding 2010; 26: 1-17. Deng W, et al. in Camellia sinensis seedlings. Plant Physiology and Biochemistry 2012; 56:35-40. Chaves M, et al. Photosynthesis under drought and salt stress: regulation mechanisms from whole plant to cell. Annals of botany 2009; 103: 551-560. Demirevska K, et al. Drought stress effects on Rubisco in wheat: changes in the Rubisco large subunit. Acta physiologiae plantarum 2009; 31: 1129-1138. N Kerim T, et al. Effect of early cold stress on the maturation of rice anthers. Proteomics 2004; 4: 1873-1882. Agrawal G, et al. Proteome analysis of differentially displayed proteins as a tool for investigating ozone stress in rice (Oryza sativa L.) seedlings. Proteomics 2002; 2: 947-959. Hajduch M, et al. HighÃ¢ÂÂresolution twoÃ¢ÂÂdimensional electrophoresis separation of proteins from metalÃ¢ÂÂstressed rice (Oryza sativa L.) leaves: Drastic reductions/fragmentation of ribuloseÃ¢ÂÂ1, 5Ã¢ÂÂbisphosphate carboxylase/oxygenase and induction of stressÃ¢ÂÂrelated proteins. Electrophoresis 2001; 22: 2824-2831. Zhao C, et al. Proteomic changes in rice leaves during development of fieldÃ¢ÂÂgrown rice plants. Proteomics 2005; 5: 961-972. Abbasi F and Komatsu S. A proteomic approach to analyze saltÃ¢ÂÂresponsive proteins in rice leaf sheath. Proteomics 2004; 4: 2072-2081. Offer S, et al. Comparative functional analysis of DPYD variants of potential clinical relevance to dihydropyrimidine dehydrogenase activity. Cancer Res 2014; 74: 2545-2554. Mimida N, et al. Divergence of TERMINAL FLOWER1-like genes in Rosaceae. Biologia Plantarum 56: 465-472. Prud’hommeÃ¢ÂÂGénéreux A, et al. Physical and functional interactions among RNase E, polynucleotide phosphorylase and the coldÃ¢ÂÂshock protein, CsdA: evidence for a ‘cold shock degradosome’. Mol Microbiol 2004; 54: 1409-1421. Rocak S and Linder P. DEAD-box proteins: the driving forces behind RNA metabolism. Nat Rev Mol Cell Biol 2004; 5: 232-241. Benyamini P, et al. Knockdown of p180 eliminates the terminal differentiation of a secretory cell line. Mol Biol Cell 2009; 20: 732-744. Ogawa-Goto K, et al. p180 is involved in the interaction between the endoplasmic reticulum and microtubules through a novel microtubule-binding and bundling domain. Mol Biol Cell 2007; 18: 3741-3751. Savitz A and Meyer D. 180-kD ribosome receptor is essential for both ribosome binding and protein translocation. J Cell Biol 1993; 120: 853-863. Shen X, et al. Association of brefeldin A-inhibited guanine nucleotide-exchange protein 2 (BIG2) with recycling endosomes during transferrin uptake. Proc Natl Acad Sci 2006; 103: 2635-2640. Gao L, et al. Proteome analysis of wheat leaf under salt stress by two-dimensional difference gel electrophoresis (2D-DIGE). Phytochemistry 2011; 72:1180-1191. Hakala M, et al. Evidence for the role of the oxygen-evolving manganese complex in photoinhibition of photosystem II. Biochimica et Biophysica Acta (BBA)-Bioenergetics 2005; 1706: 68-80.